Pernod Ricard’s Blenders Pride is India’s leading premium admix whisky. Its popularity is due to its exceptional quality and uniqueness in taste; a blended whisky of imported scotch malts and select premium Indian grain spirits. 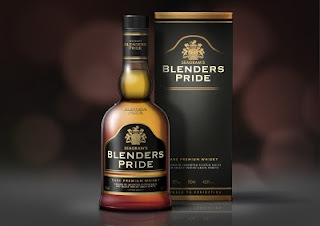 Blenders Pride is the only premium whisky from India made from grain spirit, whereas others are made from molasses. In recent years India has emerged into a new successful, confident, economically independent and lifestyle conscious India. Claessens Cartils was asked by Pernord Ricard India to redesign the bottle and brand presentation of Blenders Pride to fit this new India. The new bottle, label presentation, as well as the new gift box are a more contemporary presentation, signaling premiumness, style, and success, whilst keeping the core values of the brand alive. Making Blenders Pride the brand of choice for young successful individuals, with a discerning taste and a lust for the bohemian lifestyle.